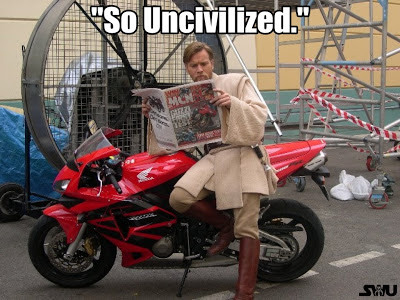 I hope I can make The Kessel Run with this motorbike. -Reading aloud- "And this month's world's sexiest Jedi award goes to Yoda. Yoda? Seriously?... I quit." What!?! Lucas sold Star Wars!!! 10 more planets were attacked today. Sad the Empire is becoming more ruthless. *Turns page* Oh there's a sale at Pennys! The instructions state here that the speeder never leaves the ground. It's got to be a typo. "Ahsoka looks nothing like her mug shot"
A Lizard named Boga for sale? Ha! I'll just stick to my bike for all my chase scenes! I felt a great disturbance in the Force, as if millions of engines suddenly cried out in terror and were suddenly silenced. I fear something terrible has happened... A road tax. Be on the lookout for more caption contests on our Facebook page (almost) every Wednesday!